If you’re like most Americans, you have acquired more “stuff” than you’ve got room to store. Over time, you’ve accumulated vehicles, boats, lawn and garden gear, spare furniture and household items, and maybe even a horse or two. Whether you live in the city or on many acres in the country, you need more sheltered storage space. With so many options available, you may be wondering how you can possibly decide on the best solution for your needs. Start by asking yourself a few questions related to the five main decision points involved in choosing a new steel storage structure: size, security, access, aesthetics, and timing of construction. Or, simply give us call here at Newmart Builders at 1-800-547-8480, and we’ll be happy to talk through your needs with you. How much space do you need, and are you likely to need even more space later? If you just need a spot to park your riding lawnmower, snow blower, and some garden tools, for example, your space need is somewhat static. If, on the other hand, you’ve recently found yourself collecting vintage automobiles, you should seek out a storage solution that will give you more space than you need right now to allow you to continue pursuing your new hobby without the risk of running out of space in the future. While wood buildings can be expanded or reconfigured if you eventually find that your space needs have exceeded your original expectation, a new steel structure can be erected much more quickly. Are the items to be stored likely to be the target of theft? Is your primary goal in seeking storage space simply to keep your teenagers’ old beat up cars out of the rain and snow without having to build an extra garage onto your house? 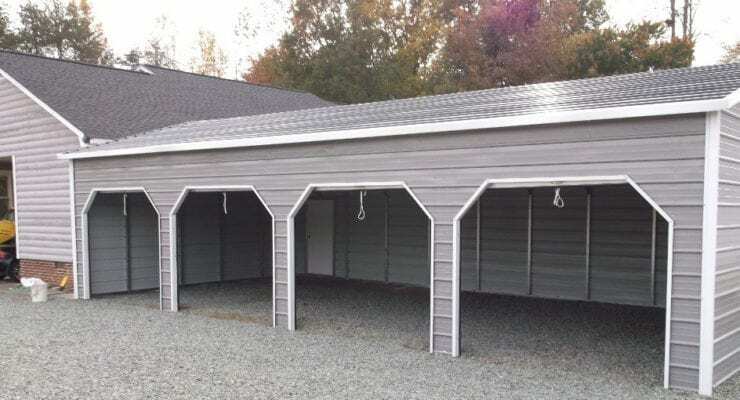 If so, a metal carport, which simply provides shelter from the elements, would be a good choice for you. Likewise, if you have large farm equipment that needs to be shielded from the weather, but is not a likely target of thieves due either to your rural location or the sheer logistical nightmare posed by attempting to steal such a large piece of equipment, an open storage shed would do the trick. On the other hand, your classic car collection should be kept in a locked garage. Browse our photo gallery now for lots examples of both open and fully enclosed steel structures. Regardless of what you’re planning to store in your new building, you’ll want to keep it safe from fire damage. While wood frame buildings can provide protection from weather and theft, only steel buildings will also provide protection from fire. In addition, because a steel structure is more fireproof than one constructed of wood, your steel building could save you money on your insurance, year after year. Who and what will be coming and going from this structure? Are you planning to park large equipment in your new building? A standard sized garage bay is not going to accommodate the height and girth of most tractors and cultivators, and while you may possess the keen driving skills necessary to squeeze your backhoe through a standard garage door, do you really want to be forced to be that precise every time you put your equipment away? You’ll need a building designed for agricultural use. And, since farm equipment is not dainty, you’ll want every part of your building to be constructed of high quality steel for durability. Are you contemplating a structure to house horses? They’re not going to walk through a normal doorway, and they’re not going to settle down if they have to look at each other all the time. You’ll need a building designed specifically to be used as a barn. If you’ve got horses, you already know they can be feisty and may kick at their enclosures. A wooden structure will provide adequate housing and protection from the elements, but only a steel-constructed building will withstand many a horse’s temper tantrum. Do you live in a deed-restricted community or are you subject to the covenants of a Homeowners’ Association (HOA)? If so, before you consider building anything, carefully review the guidelines set forth by your homeowners’ association. Be sure you are aware of restrictions on the dimensions, construction, and color of your new building, as well as any setback requirements that may be present in your community’s guidelines. Find information about our available colors and some product specifications on our Options page, or get in touch now, if you have questions or concerns about HOA requirements. Is your new structure going to be in close proximity to your primary residence? You could have the most beautiful storage facility known to mankind, but if it is sitting within a few hundred yards of your home and the color and style are radically different from that of your home, you are may not be happy with it. Imagine having coffee in your cozy kitchen in the morning, surrounded by earth tones and a calm, neutral palette, and looking out the window at a bright green building. Keep the character of your home in mind when choosing your building if you will be able to see your building easily from any window in your home. Even if your building is far enough away from your home that it can’t be seen from any window in your house, you should still keep the overall “feel” of your home and grounds in mind when choosing a color for your building. It’s all on your property, and you’ll see it, so be sure you’re going to like what you see. How much time do you have to devote to the building project? Are you going to build this structure yourself, or do you plan to contract this project? If you’re doing it yourself, how much time can you afford to devote to construction? Do you have help? Will you be forced to set it aside to attend to your full-time job or family concerns? Does the project need to be complete by a specific date? How long can you tolerate the mess and chaos of a construction project? If you’re someone who really enjoys building things and you have the luxury of time, steel construction is not extremely difficult. Whether building yourself or through a contractor, a good quality steel building can be constructed much more quickly than a wood structure. A storage building can enhance the value of your property, and more importantly your enjoyment of your property. Newmart Builders is here to help you explore your options and think carefully about your needs and wishes for this new structure. Get in touch with us now to start planning!